Today I’m going to write about mitochondria which is one of my favorite subjects and probably something you’ve never heard about. Mitochondria is the source of your energy. They are little factories in our cells that take the food that we eat and the oxygen that we breathe and convert them to energy. That energy is called adenosine triphosphate, or ATP, and it is used to support every function in the body. It’s like our body’s gasoline. 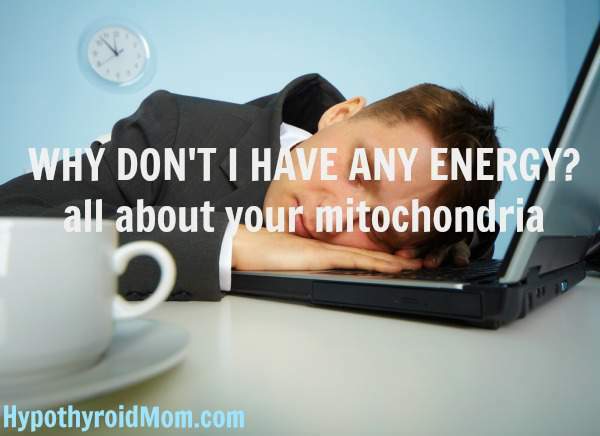 When the mitochondria are damaged, you can suffer from all sorts of symptoms like fatigue, memory loss, chronic pain, weight gain, rapid aging and much more. Each cell holds hundreds or even thousands of mitochondria. They are found in greater amounts in really active organs and tissues like muscle, heart, and the brain. In fact, the heart and the brain have the most. We have more than 100,000 trillion mitochondria in our bodies, and each one contains 17,000 little assembly lines for making ATP. So it’s a massive operation. Mitochondria are the place where our metabolism happens. When your mitochondria are not working properly, your metabolism runs less efficiently or it can practically shut down. Problems occur because these powerful energy producers are VERY sensitive and they are very easily damaged. Fatigue is the most common symptom of poorly functioning mitochondria, and it is the reason we tend to feel pooped as we age. We add constant insult and injury to our mitochondria. This causes them to break down and stop producing enough energy. Many things can damage our mitochondria. The main way our mitochondria are damaged is by uncontrolled oxidative stress or rusting. That may sound complicated, but we are all really familiar with “oxidative stress”, even if some of us don’t know what the term actually means. Oxidation is the rust on our cars, the brown color that appears on an apple when cut and exposed to air, the rancid vegetable oil or nuts in our cupboards, even the wrinkles that form on our skin as we age because of sun damage. What most of us don’t realize is that our own tissues are rusting, our own fats are going rancid, and our brains are melting as we go up our daily lives. What starts this process is some insult – too many calories, smoking, sunburn, exposure to environmental toxins, sugar (which is probably the most important mitochondrial toxin) – and that tips the balance starting this chain reaction of cellular and tissue damage that leads us down a long road to fatigue, weight gain, rapid aging, and chronic illness. So how do we care for our mitochondria? It’s really simple. You want happy, healthy, replicating mitochondria. 1. Provide the mitochondria with the correct environment to thrive in. Eat less processed food, junk food, sugar, and empty calories. Detoxify your body by getting rid of environmental and internal toxins. 2. Next, you need to exercise. It is the most powerful mitochondrial booster that you can do. Interval training is especially powerful. That’s when you go super fast, slow, super fast, slow and that increases the efficiency and function of your mitochondria so your metabolism speeds up. Strength training increases the amount of muscle and the number of mitochondria so again your metabolism increases. Muscle burns 7 times more calories than fat. 3. Also eat more real, whole, colorful plant foods. These foods are full of antioxidants and phytonutrients which protect your mitochondria. Aim for 8 to 12 servings of fresh vegetables, fruits, beans, nuts, and seeds, every single day. 4. Incorporate the following nutrients into your daily regimen. They are all part of the assembly line that help your mitochondria make energy. Speak to your doctor about adding new supplements to your regimen. The supplements that I mention are widely available in vitamin and health food stores. Do your research to ensure you select quality, toxin-free brands that are gluten-free, soy-free, dairy-free and GMO-free. Pure Encapsulations is one of my recommended brands. The Energize Plus Pure Pack is a mutivitamin/mineral complex which includes several of the ones listed and I recommend it in my Eat Fat, Get Thin challenge. 5. Increase your intake of omega-3 fats. Why? Because they help build your mitochondrial membranes. Food and oxygen have to pass into the mitochondria through these membranes. Be sure to include things like salmon, mackerel, sardines, anchovies, chia seeds, flax seeds, hemp seeds, walnuts, and egg yolks. Take a quality, toxin-free omega-3 rich fish oil supplement. If you’re curious to learn more, my Eat Fat, Get Thin book shows you how to effortlessly incorporate more omega 3s and other health fats into your diet. Dr. Mark Hyman is the Medical Director at Cleveland Clinic’s Center for Functional Medicine in Cleveland, OH, the Founder of The UltraWellness Center in Lenox, MA, regular contributor to the Today show, Good Morning America, and The Dr. Oz Show, and a ten-time #1 New York Times Bestselling author. Garth L. Nicolson. Mitochondrial Dysfunction and Chronic Disease: Treatment with Natural Supplements. Integrative Medicine: A Clinician’s Journal. 2014 Aug;13(4):35-43. Good article by Dr. Hyman. However, not everyone can tolerate the supplements that he recommends. I found out the long and hard way that I have genetic mutations and can’t tolerate COQ10 or Resveratrol. Taking those supplements made me feel worse. The mutations I have aren’t common but they aren’t uncommon either. Just a friendly reminder that supplements aren’t a one-size fits all remedy. Hi Jennifer, We’re all different and that’s part of the reason why thyroid treatment is so tricky. How does your body react to COQ10? Hi Sherry, Hypothyroidism can come with severe fatigue. Here in this article I’ve included a chart of thyroid lab tests and optimal ranges. Ask your doctor for these tests. I am 62 years old and I finally figured out myself, a week ago, that I am hypothyroid. I have been trying my whole life to find out what is wrong with me, been to many, many doctors who told me there was nothing wrong and to go to counselling. So, while I am very relieved to finally know, I am also very angry and frustrated that I have not been able to live up to my full potential because I am SO tired and sick. Even though I haven’t spoken to my 2 kids in over a year, I know that they have it, too. Now I know what to do to fix myself, but how long does it take?